In the long-ago, when people had just begun to settle in the fertile river valleys of the Saras plains, there lived a tipi-bird. In those days tipi-birds were not only curious, as they are today, but they could talk. They would sit on the riverbanks near the human settlements, gossiping and munching river shrimp and algae all day long. By evening their little balloon wings would fill up with gas and they would float away, still gossiping, blowing gas out their three ends to change direction. Well, this particular tipi-bird was so curious that she could hardly bear to go to sleep, in case she missed something interesting. "I will tell you what I am doing, if you promise not to breathe a word of it to the humans. I am tired of them changing and reshaping my river valleys, building dams and blowing up hillsides, and I don't want them to get too arrogant. Therefore I have made a plan to destroy their civilization every three hundred years." The Great Shaper pointed up into the starlit night. "See the bright point that burns with such a steady light? That is Eenah the Wanderer. Every three hundred years Eenah will become brighter and brighter. Terrible floods and earthquakes will then visit you all. The river valleys will become watery graves. The only place that will be a little safer than the rest is the high plateau beyond the mountains. But to get to the mountains the humans will have to cross these marshes, in which I have planted the monsters. When the first floods come, these monsters will awake and devour all who attempt to cross the marsh. After Eenah has dimmed to its normal brightness, the few humans who are left will have to begin again. Humans will therefore never have a chance to dominate this world." "But breathe a word of this to anyone, tipi-bird, and I will exact a terrible revenge on all your kind." The tipi-bird trembled and promised that she would be silent. Then the Great Shaper, having fulfilled his purpose, sprang once more into the sky and was lost from sight. The next morning the tipi-bird went to the human settlement, where the other tipi-birds were gathered as usual, watching everything that was going on and chattering away. She longed to tell them what she had seen and heard, but with a great effort of will she managed to keep the secret. But at the end of the day, when dark was falling and the humans were taking to their beds, she thought she would go quite crazy if she didn't tell someone. So she floated over the houses until she came to a window. Inside the room an old woman called Rema was fast asleep. The tipi-bird perched on the bedside and whispered "Listen!" And she told the sleeping woman everything the Great Shaper had said. But as she floated up into the night like a little balloon, an enormous hand snatched her up and she found herself looking into the burning eyes of the Great Shaper himself. "You broke your promise," he said in a deep, angry voice. "Oh but I didn't, Great Shaper. Listen! I spoke only to an old woman, who was fast asleep. Your secret is still safe!" The Great Shaper looked relieved. Then he shook his head. "Nevertheless, you broke your word," he said. "I now curse you and all your kind. You will lose your ability to talk, except for one word. I leave you the word 'listen.'" "Listen!" said the tipi-bird in great agitation. The tipi-bird fell toward the river valley like a flake of ash. The other tipi-birds were just rising from the riverbanks, calling to each other. And the only word they could say was "listen!" Which is all they have said ever since. But it was not long after that when the bright point in the sky known to the humans as Eenah began to shine a little more fiercely than before. And the tipi-bird went back to the human settlement and went from house to house, frantically calling "Listen!" The humans laughed at her and said: "Listen to what?" Then at last she came to the house of the old woman, Rema. When she said "listen!" Rema didn't laugh at her. Instead she remembered a dream that had come to her not long before, and she saw in the three eyes of the tipi-bird a great urgency. So Rema summoned the settlers and told them that floods and earthquakes would besiege them if they did not at this instant set out for the mountains. She also warned them of the marsh monsters that would waken with the first floods. Some humans sneered at her and refused to leave their homes, but since Rema commanded no little respect, the rest followed her over the marshes and mountains to the comparative safety of the high plateau, where they lived bleak and difficult lives, but they lived. And old Rema gave this warning to all the children and they in turn passed on the story to their own children. So to this day the tipi-bird is venerated as a friend of humankind, and every three hundred years the humans leave their settlements and go to the plateau, where they need only fear earthquakes, and not floods or monsters. Here they bide their time until Eenah's anger has passed and the great river is peaceful again. Then they leave the old and the dead behind and return once more to rebuild their homes. Once there were no people in this land. The islands were empty of them and they did not swim in the warm seas. All the people then were sky people, and they moved in silver boats in the sky. They took with them only a few living things, the most intimate of which was a creature that lived on their bodies, that was as yet peaceful and dormant. It consisted of thousands of fine filamentous appendages that attached themselves to the skin on the head and in the region of pleasure. After uncountable years in the sky, the sky-people wearied of their travels and began to look with longing at the earth below, with its warm seas and lush islands. So some of them came down in their silver boats and swam naked in the strange seas of their new home. As the waters closed over them, the creatures that lived on their bodies came alive. Each withdrew its ten thousand tentacles from its host's skin, and swam away into the sea. When the people left the water and waded up to the bright beaches of the islands, they found that their bodies were smooth and bare, and their bald heads shone in the light of the sun. And they looked at each other and thought: we are beautiful. They lived peacefully on the islands for two generations. Then one night, when the fires had been lit and there was feasting and dancing, a young woman called Amaila, who was inordinately fond of swimming, waded up from the sea. "Do not be afraid. This is the medusa, the creature that once lived on the bodies of the sky-people. The sea changed it, but it has not forgotten us. It will do us no harm." People were then calmed, and the evening festivities continued. Only one man, an elderly hunter called Haiho, kept a wary eye on the young woman. It seemed to him that she was not as she had been before; her voice was low and strained, and she looked pale as death. After watching her for a while he went to his hut and took his double-bladed hunting knife. He carefully made notches along one side of the blade. This took him a long time, so when he emerged from his hut he found that people were already retiring for the night. "Where is my son?" Haiho asked them. For he meant his son to help him keep watch on the young woman during the night. "Why, he has gone with Amaila to her hut," said the people. At this Haiho was filled with fear for his son. He ran to Amaila's hut, where a dim light burned. He clutched his knife strongly in his hand. Inside he saw a terrible sight. Amaila lay lifeless and naked on the floor, her body bleached of all color. Her head was bare again, and marked by tiny red pocks. Haiho's son lay next to her, asleep, and upon his scalp crawled the medusa, inserting first one, then another tentacle into his skin. Haiho let out a bellow that raised the whole village. As people came crowding in, he had them touch burning branches to the body of the medusa, which writhed and twisted in a most terrifying manner. He then took the serrated edge of his knife and began to scrape away at his son's scalp. His son woke in great fright and confusion and tried to lash out at his father, but the village folk held his arms fast to his sides. Haiho had made the notches on his knife to fit the tentacles, so they were caught in the serrations and came away from the skin, leaving red blotches on the young man's skull that made him cry out in pain. At last the medusa was loosed from Haiho's son, and taken to the beach and burnt. And Haiho's son came back to his senses and wept, and thanked his father and the other villagers. He told them that Amaila, no doubt under the influence of the beast, had enticed him to her hut for a night of pleasure, and that after a most memorable copulation he had known nothing else. When the villagers took Amaila's body in a boat for the customary sea burial, they noticed that small boils were erupting all over her skin, and tiny filaments were emerging from the boils. They took fright and would have tipped her body into the sea, had not Haiho stopped them. "It will not do to increase the numbers of the beast," said he, and had them row back swiftly to the beach, where they burned the body and the boat. After that the people of the islands armed themselves with the double-bladed knives that were serrated on one side. The medusa had infested their waters in great numbers, and many died before help could be given to them. The people began to use boats to move from island to island, and it was forbidden to swim more than a few strokes from the beaches. One day a new thing happened. A sky-woman fell from the sky in a burning silver boat. The boat was wrecked but the woman was still alive, although barely so. Her head and groin were covered with the fine tentacles of the quiescent medusa. 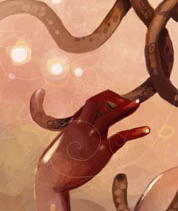 As she lay in Haiho's hut, moaning, Haiho himself took charge of removing the medusa. It came limply off as he scoured her scalp and pubis, and he was pleased. The woman began slowly to recover. A few days later, however, he found that fine filaments were springing up again through her skin. "It must have gotten into her body," he said in sorrow. There was only one thing to be done. The villagers helped drag the woman to the beach. Haiho took the knife in his hand, raised it so that it flashed in the sun. He turned the knife over so that the serrations were along the outer edge, and brought it gently down on the woman's neck. Then they built a bonfire and disposed of the body. Thus did Haiho the wise again save his people from the medusa. Ever since then, every hunter on every island in the archipelago has made sure that his knife has one serrated edge and one edge that is smooth, sharpened, and deadly. In Time's childhood the trees could move and talk. They would pull their short, thick roots out of the ground and walk to the river every morning. They would dip their roots in the water and drink. In those days the stones could also move and talk. They would roll from one place to another and mingle with trees and with the other stones. The world sounded with the creaky, whispery voices of the trees and the low, grating language of the stones, and all was well. Often a tree would fall in love with a stone, and the stone with the tree, and they would marry. Their offspring were green in color, smooth-skinned, with four limbs and no roots. Their bodies had the pliancy of young, green shoots but within them was a hard framework, like stone. These children, being rootless and light of limb, could move quickly, and they soon began to explore their world. They bathed in the watery channels the stones made for them and they ate the fruits from the trees. Among the first children there was a boy called Angud, who always played apart from the others. He had been lamed as an infant when one of his older brothers had dropped him, so he could keep up only with the slow gait of the stones and trees. He limped along with the stones and trees all day and heard their stories, and played tunes for them on his whistle. In return they found him hiding places and protected him from the teasing of the other children. As he grew he mated with both stone and tree, and awaited the time when his own children would be born. The other children were also by this time grown to adulthood, and they saw that they were quicker than the trees and stones, and were able to use their limbs to build or to take apart. Soon they grew proud, all except Angud. So they scoffed when a tree father walked unsteadily by on his roots and they frowned when a stone mother rolled too close. They knocked Angud down when he tried to defend his parents, and they took from him his whistle and threw it away. Then they asked the trees and stones to stand forever still. At first the trees and stones were angry and scolded their children, but the children turned their backs on them and walked away. Only Angud stayed behind. He did what he could to soothe the trees and stones, but the weight of their sorrow was such that they stood still. At first Angud limped among them, wailing his grief in the two languages he knew, and trying in vain to rouse his kin. But when he saw that there was nothing he could do, he found himself shelter and lived as he had done before, but in great loneliness. Soon dust and debris covered the stones. The roots of the trees became long and thin and reached deep into the ground, blindly seeking the stone underneath. Then one day Angud heard the wailings of many voices, and emerged from his shelter to find his infant children crawling out of stony caves and the hollows of trees. Then a great joy filled him. He brought them up to love the trees and stones, and taught them all the old stories. One day, when he was very old, one of his grandchildren brought to him a long piece of wood with holes. "My whistle!" said Angud joyfully, and blew on it a single quavering note. He thought he heard a faint rumble, deep in the forest, but he was too weak to blow another note, and died not long after. Then his weeping children buried both him and the whistle in the ground. After that the Angudka lived as their father had taught them, and the forest protected them from harm. As for the ungrateful children who had walked away, Angud's brothers and sisters, they soon forgot their parents. They lived and mated among themselves and they made their own language. They cut tree and stone and built houses and lost the green tint of their skin, and in time they forgot their origins. But the trees and stones still remember, even in their sleep. Their memory is not as clear as before, and the old sorrow has dulled. Only, when the descendants of the ungrateful children come to the forest with axe and rope, they sometimes hear the sound of a whistle among the trees, sweet and low. They see no one, not even their fabled Angudka cousins, and they tremble with wonder and fear. As the whistle plays its melancholy tune, the trees and stones are roused from the sleep of ages and memories come thick and fast, as clear as yesterday. Then the stones shudder in the ground and shake and crack the earth, and the trees uproot themselves. But neither can move at will any more, so the stones split and the trees crash. The ground thunders in the old tongue of tree and stone, and they say to the ungrateful children: You are our offspring. We made you, they say, but the ungrateful ones don't understand. They turn in fear and run. They do not remember their mother tongue. Vandana Singh was born and raised in India and now lives in the United States, where she teaches physics at a small college and writes fiction, poetry, and non-fiction. She has three short stories in print in the critically acclaimed anthologies Polyphony 1, Polyphony 3, and Trampoline, as well as previous publications in Strange Horizons. For more on her work, see her website. Vandana Singh is an Indian science fiction writer and professor of physics at a small and lively state university in the Boston area, where she also works on interdisciplinary scholarship of climate change. Her second collection, Ambiguity Machines and Other Stories, is forthcoming (Small Beer Press, February 2018). Website: http://vandana-writes.com/.